Eastern State Penitentiary Front – in color. The same image, in black-and-white. 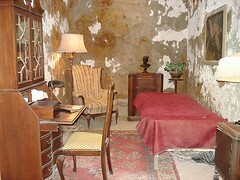 This was Al Capone’s lavishly furnished cell, when he made Eastern State his home for eight months in 1929-30. Another view, with Capone’s lamp on. Al Capone’s cell, in the sepia tone, in which his contemporaries would have seen him in newspapers and newsreels. 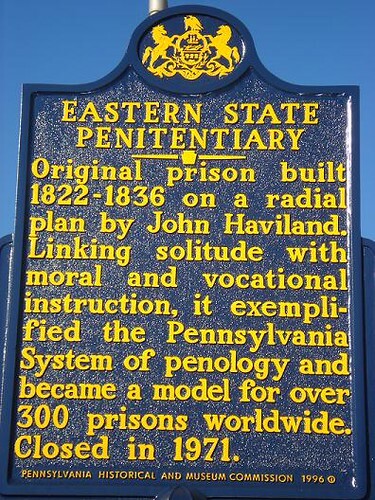 For more information, you can visit the high-quality official web site of Eastern State Penitentiary. If you'd like to leave Eastern State Penitentiary Photo Gallery 1, and return to the Home Page of Enjoying Philadelphia, please click here.